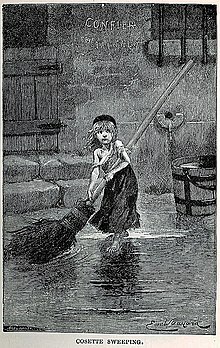 Les Misérables (1980, French; 1985, English) is a musical play based on the novel Les Misérables by Victor Hugo, with music by Claude-Michel Schönberg, original French lyrics by Alain Boublil and Jean-Marc Natel, with an English-language libretto by Herbert Kretzmer. The show was an immediate hit and went on to became one of the most successful and popular of modern plays in many productions around the world. A slave of the law! And that's all you can say for the life of the poor. Who laid hands on this good man here? What's the substance of this brawl? I will sing you lullabyes and wake you in the morning. You have only done your duty. It's a minor sin at most. You will return Sir to your post. He gave me strength to journey on! Who am I? Who am I? I'm Jean Valjean! And so, Javert, you see it's true! This man bears no more guilt than you! Who am I? 2 4 6 0 1! I'm the stronger man by far. There is power in me yet. Madam Thadenier: Still there, Cosette? Your tears will do you no good. I told you fetch some water from the well in the wood. Madam Thadenier: (cuts her off) Enough of that! Or I'll forget to be nice! You heard me ask for something and I never ask twice!! How long before the judgment day? Red — the blood of angry men! Black — the dark of ages past! Red — a world about to dawn! Black — the night that ends at last! We strive toward a larger goal! You’re such a lonely child! How pensive, how sad you seem to be. I’d fill each passing hour. Of the child that I was and the time long ago! Why you keep to yourself, why we’re always alone! The secrets that you keep. You are loving and gentle and good. But Papa, dear Papa, in your eyes I am just like a child who is lost in a wood. it’s a time that is dead! There are words, that are better unheard, better unsaid! Truth is given by God to us all in our time. We'll be ready for these schoolboys, They will wet themselves with blood! This neverending road to Calvary. One day more to revolution. We will nip it in the bud! Tomorrow we'll discover what our God in Heaven has in store! One more dawn! One more day! One day more! There's nothing that I blame you for. Can it be, you fear to die? Could it be your death means nothing at all? Here's to you and here's to me. Let us die facing our foes, make them bleed while we can! Make them pay through the nose, make them pay for every man! Let others rise to take our place until the earth is FREE!!!! That would rise up like the sun. What your sacrifice was for! Is to see the face of God! They will live again in freedom in the Garden of the Lord! They will walk behind the ploughshare. They will push away the sword! This page was last edited on 8 February 2018, at 16:51.